﻿What is SLC6A3? What does it do and how does it do it?SLC6A3 codes for a protein called either DA or DAT (acronym for alterations in dopamine transporter). DAT a presynaptic re-uptake protein that can stop the action of dopamine by using a high affinity sodium-dependent re-uptake system in the presynaptic terminals. A simpler way of saying that is to say that DAT is responsible for how, after dopamine is released into the synaptic cleft (the space between two neurons between which the neurons can send electrical or chemical signals to each other) it is retaken up by the transmitting neuron (presynaptic terminals). What is dopamine? How does it get transmitted throughout the brain? Dopamine is a neurotransmitter--a chemical involved in communication between parts of the brain across synapses--and it helps control the reward and pleasure centers in human's brains and underlies locomotion, behavior, cognition and motivation. Dopamine doesn't actually travel through the brain itself, but it can travel between synapses, which can signal the next neuron to send the message along (through chemical/electrical signals) and thus convey its message to different parts of the brain. What happens if there is a variation/mutation in the SLC6A3 sequence? In the non-coding "junk" section of DNA after the 3', there is a 40 base pair section that repeats. Normally it is repeated 3-11 times but there is association between variation in the numbers of time that this section is repeated and idiopathic epilepsy, attention-deficit hyperactivity disorder, dependence on alcohol and cocaine, susceptibility to Parkinson disease and protection against nicotine dependence. What is epigenetics, and is SLC6A3 affected by epigenetic tags? Epigenetics is a way that genes actually change over a person’s lifetime. Through interaction with the environment, chemical (“methyl”) tags can be removed or added to the DNA, which can change how sections of a chromosome are read. There has been disease research that has demonstrated SLC6A3 as being susceptible to epigenetic change. In prenatally stressed female rats (stressed pregnant rats), eating a high-fat-sucrose diet made epigenetic changes to their offspring that made it so that they produced less of the protein dopamine active transporter as adults. Thier SLC6A3 gene was hypermethylated, meaning that it had more methyl tags than most. In humans, recent research has indicated that there may be involvement of epigenetic changes to SLC6A3 which contribute to schizophrenia and bipolar disorder. Are there any medical implications of the discovery of this gene? Can it be used to uncover and/or indicate a medical condition? Is there any gene therapy and/or medical treatment for any condition related to this gene? There are significant medical implications to the discovery of this gene (and the obtainment of more knowledge about this gene), as it is associated with many medical phenomena that are common and significantly affect the lives of those who experience them--diseases such as addiction and Parkinsons as well as the disorder AD/HD. It does not, however, seem to be the only gene involved in these complex neurological expressions, so identifying mutations or changes in it does not seem to be a viable way to diagnose them. There are drugs for both AD/HD and Parkinson Disease that specifically address dopamine systems. Many drugs for AD/HD are psychostimulants which inhibit dopamine reuptake and norepinephrine reuptake (some are selective reuptake inhibitors)--one example is the relatively common drug Ritalin. For both AD/HD and Parkinsons, dopaminergic drugs (drugs involved in the dopamine system) have had mixed results. Dopaminergic drugs generally do not work as well for some symptoms of each--for Parkinsons they actually make some symptoms worse, and they can also have side effects. Does the gene affect other genes? In our research we have not found that this gene effects other genes but it is associated with disorders and diseases that can affect other genes. For example, there are other genes that are thought to be involved with AD/HD, and addiction can affect other genes through epigenetics. PCR Lab SummaryHypothesis: We expected our resultant sequence (between the two primers) to be 484 base pairs long according to the primers we ordered. Results: What we saw in practice actually did line up. 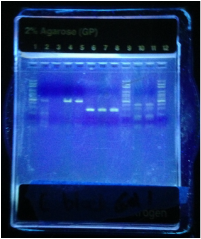 After conducting PCR and running gel electrophoresis, our length of DNA came out to be approximately 484, or closer to the 500 on the ladder scale of the gel (in the image on the left of our gel, our PCR'd sequences are in columns 4 & 5 while the ladder rulers are in columns 1, 9, & 12).